Vimal Realtors is a dynamic organization, providing Real Estate Solutions like Original Bookings, Investments, Documentation, Transfers, Property Survey and Sale-Purchase of Residential, Commercial & Industrial Properties. 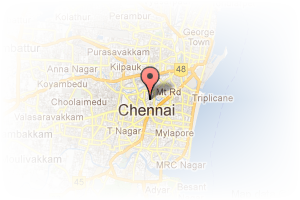 We Deals in Sale/Purchase/Renting in Chennai. We assure you the fullest satisfaction as regards to the quality service and deal in a wide network of properties. Address: Shop No.31, St. Patrick complex, No.7/21, Indra Gandhi Road, Pallavaram, Pallavaram, Chennai, Tamil Nadu, India. 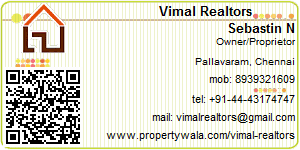 This Broker Profile page for "Vimal Realtors" has been created by PropertyWala.com. "Vimal Realtors" is not endorsed by or affiliated with PropertyWala.com. For questions regarding Broker Profiles on PropertyWala.com please contact us.